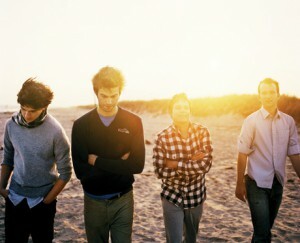 In the age of the Internet it feels like four year old band Vampire Weekend has been around forever. With only a self titled debut album and 2010’s Contra, I felt behind the curve walking into SLU’s Chaifetz Arena having missed them live a few years back. Chaifetz is definitely not the most intimate setting to see a show, but it’s not terribly large. With the stage facing only half of the arena, there was space for about four thousand. All available spaces never filled up, but the floor pit and a little less than half the seats did. The concert loudly kicked off with Esau Mwamwaya and a DJ, representing Mulawi/English dance group the Very Best. Despite a slew of strong critical ratings, I find myself not fully buying into the group. This being said, however, Mwamwaya did manage to get a decent amount of people in the pit moving with poppy songs like “Julia” and “Kamphopo”. The pair themselves were in constant motion throughout their short set, and seemed appreciative of their reception. The performance wasn’t especially outstanding, but there weren’t any real flaws save Mwamwaya holding out the microphone to a non-Chichewan (national language of Mulawi) speaking audience. The Very Best departed and the stage at Chaifetz was mounted by ambient pop band Beach House, composed of Victoria Legrand and Alex Scally (plus backing musicians). The group has been riding on the success of their last album release, titled Teen Dream, since the beginning of last year. Watching Beach House might make one forget they didn’t come to see them in the first place. Hits off their newest album like “Used To Be” seemed to put a trance on the crowd, aided by Legrand’s strong vocals, spacey stage lights, and dreamy synths. The group also paused between songs to speak to the crowd about the Baltimore Ravens and the importance of St. Louis to them. As I mentioned before, the crowd’s apprehension and successive celebration at the opening of songs like “Norway” (especially) and “Take Care” almost made me forget this was an opener. The ethereal sounds, and audience appreciation led a more-than-you-could-hope-for lead in to the headliner. After a short wait Vampire Weekend jumped onto the stage, party rap playing over the PA, before they shot into “Holiday”. The group set the tone of the evening with front man Ezra Koenig and bassist Chris Baio hopping across the stage while playing their pop anthems. It wasn’t hard to see how they’ve always been described as a hipster band considering the flannel, oxford shirts, skinny jeans, and a basketball jersey (new trend) they sported. Koenig’s voice, instantly recognizable, sounded just as versatile as ever, and to say the instrumentation popped would be an understatement. Stage affectations were mostly kept to a minimum, but all props and lights were utilized to an impressive extent. Moving chandeliers created a ballroom feel during “Cape Cod Kwassa Kwassa”, and a tapestry displaying the lyrics to “White Sky” (or the fictional port of Contra under the right lights) were a welcome addition. It was hard to find a break between the songs, and even slower pieces like “I Stand Corrected” flew by. Particularly impressive was the band’s orchestration of the complex “California English”, which Koenig introduced by demonstrating it’s use of auto-tune. Also great fun to watch was basketball jerseyed drummer Chris Tomson, especially while helping hammer out the blistering “Cousins”. Koenig wisely started off what he called the “second half” of the concert with “A-Punk”. As you might expect, this one had more people dancing than at any other point during the concert. Besides “A-Punk”, the second half of the concert moved slower with Springsteen cover “I’m Goin’ Down” and “I Think Ur A Contra”. According to Koenig, the latter song was played for the first time ever at this particular show. The first set finished off with hits “Campus” and “Oxford Comma” played back to back. Needless to say the group was welcomed back for an encore, and a chance for the audience to hear any hits they were hoping to hear. They began by playing Contra’s “Horchata” meaningfully, but the older “Mansard Roof” had more heft. It was also aided by the crowd doing a Koenig led “dance”, which entailed everyone raising their hands and twiddling their fingers. The last song of the night, as predicted by some members of the audience, was “Walcott”. This one highlighted Rostam Batmanglij playing the speedy keys part, while Koenig and company were just as flawless as ever. Like the rest of the night, the audience strongly responded to their efforts (mostly by singing along). I was definitely satisfied by Vampire Weekend’s very strong showing, as was everyone else. Although brisk, the concert was rewarding and made me hope for their eventual return.